Hugo van der Goes belongs among the most important and innovative Flemish painters of the late 15th Century. The scant number of panels that has survived is acknowledged by a new monumentalism, a specific colour spectrum and an unparalleled individualistic manner of portraying figures and facial expressions. He was probably born in Ghent around 1440. After the departure of Joos van Wassenhove to Urbino, Hugo van der Goes is probably the most important painter in his hometown starting at circa 1470. He was selected to be deacon of the painter's guild various times. He received important assignments from the Burgundian court, from various church institutions, and the rich Flemish bourgeoisie and the Italian business associations that were located in the Burgundian Low Countries. The monumental triptych, which he painted per assignment by the Bruges-based Medici banker Tommaso Portinari, arrived in Florence in 1483 and inspired Italian artists such as Domenico Ghirlandaio. Giorgio Vasari mentioned in 1550 in his Lives that the Portinari-triptych was painted by "Ugo d'Anversa", whereby the reconstruction of the oeuvre of Van der Goes, who appears to have signed no single painting, became possible. At the highpoint of his career, Van der Goes closed up his studio in Ghent in 1477 and went as frater conversus to the reformed community of the Roode Klooster near Auderghem (Brussels). There he enjoyed certain privileges; for example, he was still allowed to execute painting assignments. During his stay in the cloister, his psychiatric condition worsened. Upon the return from a visit to Cologne in 1482, he encountered an acute attack of depression and wanted to kill himself. He died a short time thereafter in the Roode Klooster. The majority of the original production of Van der Goes has not been preserved. Numerous later copies after the lost originals by his hand bear witness to the immense influence of the Ghent native on the Flemish art. German artists also familiar with Van der Goes via prints by Martin Schongauer. After Van der Goes's death in 1482, the Ghent book illustrator Alexander Bening, who was married to a niece of the painter, must have inherited the model drawings and patterns of Van der Goes. This helps explain the noteworthy spread of his compositions in the illustrated book of hours by the so-called Ghent-Bruges school. Simon Bening, the son of Alexander Bening, initiated the model drawings by Van der Goes in Bruges. 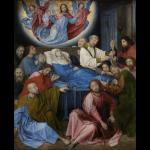 Gerard David and the members from his work place were inspired by the Ghent artist. Birth of Van der Goes. Although his birthplace is not documented, it appears that he was born in Ghent or its environs. Philip the Good releases Van der Goes from a mysterious exile. Van der Goes becomes the Master of the painter's guild in Ghent. The painters Joos van Wassenhove and Daneel Ruthaert vouch for him. In assignment from the city of Ghent, he carries out his painting in the function of the Great Grant of the city. Also in the following years, Van der Goes works on these decorations at the behest of the city. For example, he paints papal blazons. In March and April, the painter worked in the commission of the Burgundian court in Bruges with the decoration on the occasion of the wedding of Charles the Bold and Magareta of York. On 18 October, Van der Goes invited, along with other members of the painter's guild, painters from Doornik to the assembly in Ghent on the occasion of St. Luke's day. Alexander (Sander) Bening becomes Master in the Ghent painter's guild. Hugo van der Goes and Joos van Wassenhove vouch for him. In 1480, Sander Bening married Catherina, a cousin of Van der Goes. Joos van Wassenhove departs from Ghent and travels to Italy. He goes into the service of Federico da Montefeltro, the Duke of Urbino. As Giusto da Gand, he becomes the court painter of the Duke and is involved with the decorations of his palaces in Urbino and Gubbio. Van der Goes and his fellows are paid by the city for decorative works on the occasion of the Joyful entrance of Charles the Bold in Ghent and for the paintings and blazons for the occasion of Charles the Good's funeral. Van der Goes is paid by the Burgundian court for the paintings and blazons on the occasion of Charles the Good's funeral. Van der Goes rents a place from Clais and Filips van der Zickele in the Sint-Pietersnieuwstraat in Ghent. The painter is repeatedly chosen as deacon of the Ghent painter's guild (1474, 1475, 1476). In this period, Van der Goes paints the Adoration of the Magi, or the so-called Monforte Altarpiece (Gemäldegalerie, Berlin) and works in service of Tommaso Portinari on the monumental altarpiece with the Adoration of the Shepherds, or the so-called Portinari Altarpiece (Galleria degli Uffizi, Florence) which only in 1483, after the death of the artist, arrived in Florence. Van der Goes leaves Ghent and becomes a lay brother in the Roode Klooster, where his half-brother Nicholas is a monk. Through his notoriety, Van der Goes receives certain privileges from the cloisters' community. He is allowed to travel and receive high-ranking visitors, amongst which is Archduke Maximilian. Moreover, he was permitted to drink wine, thus observed the cloister chronicler Ofhuys. It is a privilege of which clearly took great advantage. During his stay in the cloisters, Van der Goes continued to carry out projects, though the completion of the paintings caused him great concern. In service of the City of Leuven, Van der Goes came to assess the unfinished works of Dieric Bouts for the Leuven city hall. From the city administration he received a "stoop" of Rijnwijn for this service. Van der Goes probably also completed the Bouts unfinished Triptych for Hyppolite Berthoz. On the left panel he painted the patron portraits of the couple. On the return trip from a visit to Cologne -according to the cloister chronicler Ofhuys-, he was struck by an acute depression and unsuccessfully tried to kill himself. His entourage, amongst which was his half-brother Nicholas, decided to take him to Brussels and from there to the Roode Klooster. He died shortly thereafter and was buried in the atrium of the cloister. Van der Goes's Portinari Altarpiece arrived in the following year in Pisa and was transported via canal to the Porta San Friano in Florence. The altarpiece was erected in Santa Maria Nuova. The raw physiognomy of the shepherds made an impression upon the painters from Florence. Domenico Ghirlandaio was inspired by Hugo van der Goes for his Epiphany in the Sasseti chapel. Jean Lemaire named Van der Goes as one of the most important painters in his panegyric to Margareta of Austria. Gaspar Ofhuys, monk in the Roode Klooster, reports in his chronicle on the death of Van der Goes in 1482 and of his psychological malady. Albrecht Dürer mentions in his journal that during a visit to Brussels in the Nassau palace, he saw a ‘good painting' by Van der Goes in the private chapel. It is probably about a presentation of the seven sacraments. Giorgio Vasari mentions in his Lives that "Ugo d'Anversa" had made the panel in Santa Maria di Nuova (the Portinari Altarpiece). Marcus van Vaernewyck describes works by Van der Goes that were destroyed during the Iconoclasm.